Sorry for the delay, but it took a while to write everything up and sort through the photos I wanted to upload. Also, I will update this entry with links to any of the panels that were filmed and put on Youtube or another video streaming service, if I can find them. If anyone else finds one, let me know, send me the link, and I’ll add it! Photos from the con are going up on my cosplay DeviantART account if you want to check those out. The first thing that I ordered was my wig. I needed a nice, lovely shade of redhead, something distinctive, but also natural-looking. Amphigory is my first choice for wig shopping, so I looked at the selection and chose the Alicia wig in Fire Red. It’s always hard to tell for sure what a wig’s color when shopping on the internet, but I did my best. Zev from Amphigory was a fantastic help when they let me know that they were out of the regular Alicia, but they did have Alicia XL in the same color. Not wanting to wait until the last minute, I asked Zev to send me the XL and they did… at no extra charge! Thank you so much for your help! The wig was perfect when it arrived, albeit needing a trim to get it the right length. Luckily, Arda Wigs has some wonderful tutorials on how to trim a wig, both the mane and the bangs, as well as recommended tools to get a more natural cut. I ended up trimming the wig a little too far, but it was still close enough, I think. Next order of business: the coat. That tan leather coat was, in my mind, key to making the costume work. If I didn’t have the right hair and the right jacket, it wouldn’t work. I had the former, but how to get the latter? I could have combed through all the thrift stores in my area, looking for something close, but I was unwilling to spend that amount of time and frustration looking for something that might not be there. And I wanted to have the coat when I looked for the shirts, pants, shoes, and belt so I could see if they matched. 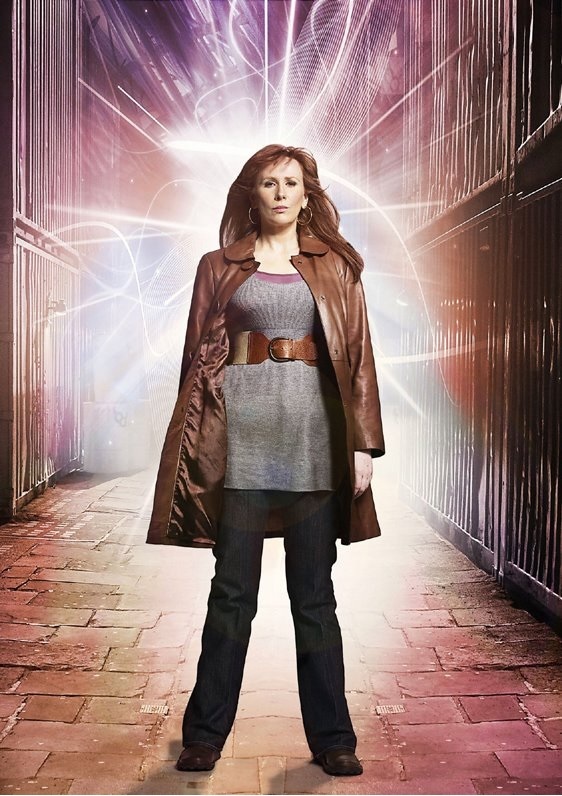 The Facebook page Donna Noble Costuming and Collecting was a lifesaver, as they identified many of the types and brands of items that Donna wears in the fourth season of New Who. One of the photos identified Donna’s coat as a “tan leather Autograph jacket.” Armed with this information, I dove into Ebay. And guess what? I found the jacket. The same exact kind of jacket, in the right color, from England for $30. (It ended up being $60 with shipping and handling added, but so worth it!) My deepest gratitude to lisafever4eva who sold it. Thank you so much! Jacket in hand, I headed to the nearest Goodwill and combed through their racks for two hours searching for the purple shirt, the grey ribbed tunic/long shirt, dark blue or grey pants, the wide belt, and simple, comfortable brown shoes. None of the shoes fit right, but I did find a nice dark purple t-shirt with a scoop neck that I think could also be used for one of her other outfits. Finding a grey short that was as long or longer than the purple one, with a deeper scoop neck, with no decals, and preferably without long sleeves (as the sleeves of the jacket were a little tight and didn’t give me much movement with long sleeves) was much, much, MUCH harder. Finally I settled for a light grey, ribbed bare-arm shirt that was about six feet long. (Maybe not that long, but it was ridiculous! It wasn’t extra wide, but whoever it was designed for much have had a ridiculously long torso!) But too long is better than too short, so I got it, reasoning that I could always cut it to the length I needed. I found a pair of comfy, dark blue elastic-waist jeans that fit perfectly on the first try. Most painless pants shopping experience of my life. I did find a tan elastic belt that was close to the shape of the one Donna wears, although it wasn’t really wide enough. But beggars can’t be choosers, so into the shopping bag it went. The ensemble seemed to work, so I purchased them and headed for the nearest Wal-Mart to search for shoes. I start at Wal-Mart, not because of the quality, but because they are usually the cheapest. If I couldn’t find anything there, I would go to Payless or the Shoe Factory. I wanted something simple, dark brown, and comfortable to walk in, which means no heels. I can’t do heels, not even the 1-inch ones. Makes my lower back hurt. I wandered into the shoe section and my heart sank. I hate shoe shopping. Everything is so expensive and it doesn’t last. But I forced myself to keep looking. Good thing too. I found a pair of ankle-high Faded Glory brown boots with virtually no heel that just slipped on and seemed pretty comfortable to walk in. Thank god they were on sale. The original price was $25. I got them for $7. The last thing I needed was something to darken my eyebrows a bit and make them a little more reddish to match the wig. (People tend to forget that in order to make a wig look natural, you’ve got to color your eyebrows.) I found a “topaz” eyeliner from Revlon that seemed close, also at Wal-Mart; my lipstick was Love My Lips Creamy Wine, given to me by my friend, Foxglove. The ring I decided to wear was a big green one that was in my aunt’s costume jewelry, which I inherited. It wasn’t perfect, but it would do. I didn’t bother with the earrings, as my ears aren’t pierced and I figured no one would see them anyway under the wig. I’d already booked a room at a Red Roof Inn about 15 minutes away from the con on my friend Kei’s recommendation, as rooms at the Hunt Valley Inn where the con was being held were too expensive for my limited budget. Preregistration is also a must for me, although I waited a little bit long and so did not get the cheapest price ($70), but still better than at-the-door, which is typical for any con. I love it when cons post their itinerary online because then I know when things start and can plan my day accordingly. None of the panels started until 3pm and doors didn’t open until noon, so I was able to have a pretty leisurely morning. (Well, leisurely while running around doing errands that I couldn’t do yesterday without my paycheck. >_<) According to Mapquest, my destination was about an hour away, so I planned on leaving somewhere between 10am and noon. It was closer to the latter when I finally set out, but again, no pressure. Also, funny geek irony: I was dressed in a Star Wars T-shirt listening to Original Series Star Trek soundtracks while driving to a Doctor Who convention. Love it!The trip down was simple with no surprises and pretty good traffic, as it was the middle of the day. I decided to go check it an Red Roof first so I could drop off my stuff and get in costume. My room was on the third floor, which wasn’t bad, although the outer walkways were like wind tunnels. Room 309 was small, but comfortable with a mini-fridge, microwave, sink, tiny bathroom, TV (which I never used) and ginormous twin beds. (I’d originally booked twins because there was a chance some of my friends would be going with me. Sadly, they all chickened out. :-P) After depositing my stuff, changing into Donna, and making sure everything I needed for the day was in the Millennium Purse (my faithful con companion from my Yu-Gi-Oh! cosplay days), I set off for the Hunt Valley Inn. There were two routes to the con, but I chose the one that wasn’t the highway. It took a little longer because there were a million traffic lights, not to mention crossing trams, but it only required two turns so I was less likely to get lost. (Unlike 98.5% of my generational demographic, I possess neither a smartphone, nor a GPS, so if I deviate from my Mapquest directions, I can get lost pretty quick.) But I got to the Inn without incident and even found a parking spot that did not require me to tramp a half mile across asphalt. I did run into some renovation construction for the Inn, so it took me two tries to actually reach the front door. (Sometimes short cuts take longer.) I slipped inside… and my belt promptly undid itself and fell to the floor. This was really the only consistent issue with my costume: the belt, despite being elastic, did not stay fastened very well. When I was standing or walking, it wasn’t bad, but if I wore it too long or sat down? Nope. I fixed this with a long safety pin for Saturday and Sunday, but on Friday, Donna spent about half the time belt-less. There was virtually no line for registration, although a lot of people were milling about. I joined the mass and got my badge in about five minutes, tops. Fastest registration check-in ever! Badge in place, I wandered down the hall beside registration which looked like it was the Artist Alley. However, only a few vendors were fully set-up, and the Dealer’s Room was still being put together. Apparently there had been a different convention just the other day, so ReGen vendors had gotten virtually no time to set up. But I wasn’t particularly interested in buying anything at that point; I often use Artist Alley and the Dealer’s Room as a time-killer between panels, since there’s so much pretty stuff to look at. But I wanted to explore the rest of the convention area to get a lay of the land. At 3pm, the first two panels began. One was about breaking into the gaming world. The other was a welcoming panel with the hosts of ReGen: Oni Hartstein and James Harknell. I’m not a huge gamer, and I’d never been to a welcome panel before, so I traipsed over to Panel 1. I’d seen Oni and Harknell at a Katsucon panel two years ago, and that was how I heard about the first con, Intervention, “the premier showcase of online creativity,” which they created with their company Onezumi Events. It sounded interesting, so I’d preregistered for it in 2013. Unfortunately, I got sick and was unable to attend, but I was still on Onezumi Events’ email list. When (Re)Generation Who was announced, I got an email telling me about it. That was how my interest was piqued. Oni and Harknell are two lovely people who pour 150% into what they do. I can’t imagine the amount of stress, prep, and organization required to create and run a convention. I think you’d have to be a little insane. I tip my hat to them and their staff; despite some technical difficulties, the con ran (at least to my eyes) pretty smoothly. And that’s all thanks to the folks behind the scenes. I stayed in the room for the next panel, “Doctor Who Novelization with John Peel.” As a writer, I was interested in attending any and all panels relating to writing and tie-in material. Doctor Who has such a wealth of media, from the TV series, to Big Finish audio dramas, to graphic novels, to short story anthologies, to original novels and novelizations of episodes. John Peel is a lovely British gentleman with loads of great stories about working on Doctor Who books. His favorite stories from the television series were ones that involved the Daleks. When Target Books was looking to release a Doctor Who book, Mr. John suggested taking a Dalek handbook written by Terry Nation, the creator of the Daleks for the show, updating that, and re-releasing it. Target loved the idea… and told him to contact Terry for them. Mr. Terry is apparently one of the most laid-back, generous people imaginable, so when Mr. John asked him if it was okay to update and re-release the Dalek handbook, Mr. Terry said yes… but he was took busy to work on it at the moment, so could John do it instead? And later, when Mr. John realized the updated handbook wasn’t working and suggested that perhaps some novelizations of the Dalek episodes should be written instead, Mr. Terry said yes… on the condition that John would write them. I jumped over to Panel 2 for “Death in the Moffat Era.” I confess that while I’ve enjoyed (and continue to enjoy) Doctor Who, there have been some things, especially in more recent seasons, that do bug me if I think about them. I don’t like engaging in the often rampant Moffat-bashing that I’ve seen online, but I do disagree with some of his creative choices. This panel was arguing (pretty calmly and respectfully) that the creative choice to kill and then resurrect characters over and over and over again diminishes the impact of death. Some examples were Rory’s numerous deaths and subsequent resurrections, essentially as a “man in the refrigerator” for the sake of advancing Amy’s story. (While part of me enjoyed the “woman in the refrigerator” trope being reversed, it still diminishes the character who suffers from it.) The panelists Clay Dockery, Stephen Webb, Decca, and….sorry, I did not catch the other lady’s name (but she was dressed as Amy Pond), made some interesting points, and had definitely watched the series more often or more closely than I had. Did you notice that Strax the Sontaran is killed and then brought back in a later episode with no explanation of how he was resurrected? Yeah, me neither. I slipped out a little early from that panel to race over to the Large Panel Room for “Trial of a Timelord: The Aftermath” with Colin Baker (the 6th Doctor), Nicola Bryant (his Companion Peri Brown), and Nev Fountain (writer for Big Finish audio dramas.) It was a discussion of an (apparently) controversial and in some ways unsatisfying story that marked an abrupt end to the 6th Doctor’s era. Now, normally I’m very adamant about not getting spoilers, but with Classic Who I make an exception. It’s been around so long and there’s such a wealth of material that spoilers are pretty much impossible to avoid. Sometimes it was a little hard to follow the conversation since I had not seen the episode and therefore had almost no frame of reference to compare their thoughts and changes or additions to, but it was still interesting. Both Colin Baker and Nicola Bryant have continued the stories of their characters in Big Finish audio dramas, allowing Mr. Colin to “peel away the layers” of his initially irascible Doctor and allow him to grow in a way that wasn’t done in the show because he was given enough time to do so. It was really interesting to listen to. Now I had a conundrum. I could stay in the Large Panel room and listen to Nicola Bryant, Sophie Aldred (the 7th Doctor’s Companion Ace), and Deborah Wattling (the 2nd Doctor’s Companion Victoria) discuss the role of the Companion in Doctor Who, or I could do back to Panel 1 for “The First Doctor and the Legacy of Barbara.” I wanted to attend both, but decided on the latter because I have actually watched some of the first series so I was more familiar with Barbara, one of the Doctor’s first Companions. I felt that I would get more out of that panel, as I had never seen Ace, Peri, or Victoria in action. It was a smaller panel, hosted by Clay and Stephen, and “Amy Pond” again who I’d already seen, so I felt more comfortable and willing to contribute to the discussion of Barbara’s role and how she broke the mold for female characters, especially for the 1960s, and the dynamic she brought to the character relationships in the show. It was a lot of fun and I think everyone learned something from it as well, which is always the best kind of panel. Afterwards, Stephen thanked me for coming to the panels and invited me to attend “The Greatest Cosplay Show in the Galaxy” at 11pm that night so I could show off my Donna costume. I wasn’t entirely sure, as I didn’t know what a “show” entailed. If they required skits, forget it, but if all I had to do was walk on stage and walk off… heck, that could be fun. So I said I’d try to be there. Then I went up to scout out the Dealer’s Room and Artist Alley, not really planning on buying anything, but I ended up purchasing a copy of Short Trips: Destination Prague, an anthology of Doctor Who short stories. At this point I was feeling under the weather. My wig had been uncomfortable all evening (I’d taken it off during panels) and my head felt tight and stretched, which for me usually signals the onset of sinus trouble. I thought that maybe I felt bad because I hadn’t eaten an actual meal since breakfast (oatmeal and a yogurt cup), subsisting off of water and a few nibbles of peanuts I carried around in the Millennium Purse. With only an hour until the Cosplay Show, I headed for the hotel restaurant. It was really full, but there was space at the bar, so I perched there, feeling really young and out of place (which is weird because I’m 27 and it’s not like I haven’t been to a con before). Another attendee gave me a cute little Donna badge (“Well you’re not mating with me, sunshine!”) for being a Donna cosplayer, which was sweet. (I later learned that these badges that people can collect are a thing at many conventions, although this was the first time I’d heard of it. I guess anime cons don’t do that?) The bartender was very nice, although he had to be a whirling dervish with all the drink and food orders coming in. I ordered an ice water and a chicken quesadilla and chatted with one of the con vendors at the bar until my food arrived. Oh, it was so good! I ate half right then and put the rest in a to-go box for my lunch the next day. With a half hour to spare, I cleaned up in one of the bathrooms and headed for the Large Panel Room to get in line for the Greatest Cosplay Show. There were a lot of people! For a while we were just this amorphous mass of Whovians, but slowly we got sorted into chronological order. For a while, I chatted with a Miss Evangelista cosplayer (a character from the episodes “Silence in the Library” and “Forest of the Dead”), a Mr. Saxon cosplayer, and another Donna. The line wasn’t as well-organized as it could have been, as I think half of us didn’t realize that we needed to fill out a little announcement card with our name, character, and what episode we were from. Luckily I saw some other people holding them and filled one out (although to my shame, I put “The End of Time” as the episode that my costume was from rather than “Journey’s End.” Hey, it’s an easy mistake to make!) Going up dark steps when you don’t have your glasses on is difficult, but I did it! I walked on stage, twirled so people could see my costume, bowed, and exited. I stuck around for a while to see the remaining cosplayers, and then, gratefully, headed back to my hotel room. A quick snack of yogurt, and then to bed. Even though there were no cats to wake me with their demands for breakfast, I will woke up at 7:30am. Nothing in particular was happening in the morning at the con, so I had a leisurely breakfast (yogurt and a pudding cup), took Sudafed to fend off any potential sinus issues, and showered. Today, I decided to wear a wig cap and see if that made me feel any better. Also, I used a large safety pin to secure my belt so it wouldn’t go flying off. I took another look at the schedule and decided to go to a 10am panel, “The Mystery of the Doctor with Andrew Cartmel.” I hadn’t heard of him before, but a quick look in my program booklet told me he was the script editor for the 7th Doctor’s run on the show. Script editor? I am so there! It was colder than yesterday, so cold that it was snowing! Nothing major; just a few little flurries of flakes, but it still made me huff and puff a bit. (I am so done with winter.) Got to the con with time to spare and toddled on in to Panel 1. Andrew Cartmel is a soft-spoken British fellow with a fondness for dark clothing. It was really interesting to hear what it was like being a script editor of Doctor Who, which in those days was more akin to being a showrunner. Mr. Cartmel felt that some of the mystery surrounding the Doctor was beginning to wane, especially since at this point we knew that the Doctor wasn’t an anomaly, but rather part of the Time Lords. (He also didn’t care for the sonic screwdriver.) So the 7th Doctor became more mysterious and manipulative than many of the previous incarnations, sinking back into enigmatic shadows. He also introduced Ace, a cheeky demolitions expert who many fans have called one of the most influential Companions of the classic series. Alas, BBC decided to pull the plug after three seasons, bringing Doctor Who to a halt in 1989. Mr. Cartmel then went on to write scripts for other shows, including the Doctor Who spin-off Torchwood, novels for the New Adventures and Past Doctors lines, and was script editor for several Big Finish audio dramas. I would have loved to get his autograph, but when the panel ended, he had to disappear in a hurry, so I didn’t get the chance. 11:00am. Time to get in line for the live Skype with Tom Baker. Yes. Really. Tom Baker, the 4th Doctor. Not kidding. I knew the line would be forming before the doors were supposed to open for seating at 11:30, but it was still kind of insane how long the line was. I got out of Panel 1 and hopped in at the end of the line a few yards back. Good thing too; reports from other Regenerators (the “official” name for attendees of the con) said that the line then went around the corner, up two flights of stairs, and down another hallway. I don’t know how many people were in line, but I overheard someone say that the Large Panel Room where the Skype would take place could only seat 800 people. I was one of the lucky folks who got to go in. (Don’t know how many had to be turned away at the doors… hopefully they’ll be able to watch a video of it. I’m sure people were filming.) I kept my fingers crossed that there wouldn’t be any technical difficulties with the Skype session. And apparently it was fine, because part of the “pre-show” was a stuffed bear peeking into the Skype screen, courtesy of Mr. Baker. When the Skype actually started, the crowd went wild. Lots and lots of applause, and he hadn’t even said anything yet! Still, it was really neat to actually see him. Fans apparently submitted questions to be asked earlier rather than folks lining up at a mic during the session itself (which I was grateful for; it kept things moving along.) One of the con chairs Oni’s assistant and Community Manager/Social Media, Kara Dennison, asked the questions. Throughout the Skype session, Tom Baker was amusing, patient with the numerous questions, and rather… jolly. That’s the best word I think to describe him. He wants people to be happy and ultimately wanted the Doctor to be fun and adventurous to inspire others. (He also has five cats and recites Shakespearean sonnets to his dog. ^_^) It was funny; whenever he finished answering a question, or realized that he was rambling far afield from the original question, he would stop, and in a deep, serious voice say, “Ask me another question.” I don’t know why; it was just really funny. And one of the best questions was the last one, which was, “Do you have any words of advice?” And Mr. Baker started laughing and replied, “Beware of old men giving advice!” He got a standing ovation at the conclusion of the session that must have gone on for five minutes. Initially, when I went to ReGen, I told myself that if I didn’t see the Skype, it was no big deal. But I am really glad that I got to see it. Now I had two hours before the next panel, so I decided to be intelligent and go back to my hotel room for a bite to eat so I wouldn’t be tired, hungry, and in pain the rest of the afternoon. So far I hadn’t needed to take off my wig once, my head didn’t hurt, and my belt was still in place (if a little tight). After eating the rest of my quesadilla, I returned to the con with plenty of time to reach the Large Panel Room for “The Two Doctors: Sylvester McCoy, Colin Baker,” and get a seat about four or five rows from the stage. It was also a seat along the aisle, so I had an even better view. While waiting for the panel to start, a man in a maroon shirt came up and asked me about how I felt about Donna and the end of her time in the series. (He seemed to think that he’d talked to me yesterday, although I confess no recollection of it, so he may have confused me with someone else.) It was really nice to be able to talk to someone about Doctor Who, some of my likes and dislikes, and my knowledge of the series, both New and Classic. He seemed impressed at how much information I’d managed to absorb in just two years. (I was introduced to Doctor Who in 2013.) We chatted until just before the panel started. Sylvester McCoy and Colin Baker are funny on their own; but they are hysterical on stage together. They have a fake rivalry going on. Colin Baker maintains that, since he wasn’t there for the regeneration scene, all of the following Doctors are impostors while he’s still the real Doctor. Sylvester McCoy snarks about the 6th Doctor’s limited screen time at every opportunity. When they walked in, the moderator, CW Cobalt, was sitting on the far right. Mr. Colin and Mr. Sylvester played musical chairs for a moment, acting like they didn’t want to sit next to each other, and then Mr. Sylvester moved the moderator into the middle seat to act as a barrier. The two of them poked fun at one another throughout the panel as they shared stories from their film days and their impressions of the Doctor. At the anime conventions that I’ve been to, we’ve always had to clear the room and then come back in if we wanted to get seats for the next panel. But, I guess since these panels were small enough and we had plenty of room, no one made us leave! So I got to stay in my seat for the next three panels. (Yes, I was in the same room, same seat, for four hours. Totally worth it though.) The next panel was “Tribute to the Second Doctor: Patrick Troughton” with John Peel, his interviewer Dr. Arnold T. Blumberg, and Deborah Watling who played Victoria Waterfield, one of the 2nd Doctor’s Companions (who said she was referred to as “Leather-lungs” because of her screams. She even cleared out a neighboring restaurant once.) William Hartnell (1st Doctor), Patrick Troughton (2nd Doctor), and Jon Pertwee (3rd Doctor) have all passed away, unfortunately. (I was a year old when Mr. Troughton died.) But this panel told me more about him and how key he was in keeping Doctor Who alive. He was so different from William Hartnell’s grumpy grandfather figure and that freed Doctor Who immensely. Now if an actor had to leave the show, it was no big deal; just have them regenerate, and voila! You have the next Doctor. Apparently Mr. Troughton was a sweet, lovely person, but also a very private one who usually did not give interviews. For a long time he didn’t even go to conventions because, according to John Peel who did get to interview him once: “I wouldn’t know what to say!” Patrick Troughton and Jon Pertwee apparently also had a fake, fun rivalry as the 2nd and 3rd Doctors, similar to what I saw between Mr. Colin and Mr. Sylvester. Mr. John said that Mr. Troughton got over his fear of cons when he was backstage at a con event for Mr. Pertwee, but the 3rd Doctor was either late or sick… the latter, I think. So Mr. Troughton put on the 3rd Doctor’s signature coat (which was rather too big for him), put on a red clown nose, and ran out on stage with the cape spread out like bat wings. Mr. John said that, for a moment there was dead silence and then the audience started roaring with laughter and applause. By being so very different and comedic, Mr. Troughton won over the fans, both at that con and as the 2nd Doctor. Ms. Watling also shared some amusing stories from her time as a Companion. She said that Mr. Troughton and Frazer Hines, who played another Companion, a Scottish lad name Jamie McCrimmon, liked to play pranks. One that she told us about involved the London Underground. Victoria had been kidnapped (again) and the 2nd Doctor and Jamie were looking for her in these tunnels. Jamie was worrying about whether or not they would find her while the 2nd Doctor tried to reassure him that they would. Their third companion, Professor Edward Travers, played by Ms. Watling’s real life father, Jack Watling, clomped along behind them, grunting and muttering. Ms. Watling was behind the camera, watching the scene as they filmed it. They walked along and then the 2nd Doctor said something like, “Look, Jamie! Victoria definitely came this way!” And he bent down slowly and picked up a handkerchief, saying that it was Victoria’s. They kept going and then the Doctor stopped again, bent down, and picked something up. It was, as she put it, “a pair of knickers.” And again, the Doctor said, “See, Jamie! Victoria did go this way! These are hers.” And, in a deep, threatening voice, Ms. Watlings father said, “How would you know?” And everyone just died of laughter, both on set, and in the ReGen audience when she recounted the story. Brilliant! The next two panels were “TARDIS TEAM: Seventh Doctor and Ace” (Sylvester McCoy and Sophie Aldred) and then “TARDIS TEAM: Sixth Doctor and Peri” (Colin Baker and Nicola Bryant). Both panels were filled with hilarious behind-the-scenes stories, insights into their characters, how they got their roles, and had a brief Q&A. I remember a few distinct moment during these panels (I’m sorry I can’t recount more.) In the first panel, I remember one fan coming up to the mike, holding up a pair of spoons and asking Mr. Sylvester to play the spoons. He reached into his jacket… and drew out his own pair of spoons. Then he orchestrated the audience to sing the Doctor Who theme song (which Ms. Sophie did with gusto) while Mr. Sylvester played the spoons on the moderator, CW Cobalt, and Ms. Sophie. (There’s a clip of it on YouTube.) I also remember how happy Mr. Colin and Ms. Nicola were to be able to explore their characters and their arcs through the Big Finish audio dramas, which just makes me want to listen even more! All of the actors and actresses seemed to have good relationships with one another and were just really funny, genuine people. With the conclusion of the 6th Doctor and Peri panel, I headed over to Panel 2 for “Doctor Who: the Wilderness Years (1990-2005)” with Andrew Cartmel, John Peel, CW Cobalt, and Keith R. A. DeCandido, all of whom I’d seen before at various panels. (I had not seen Mr. DeCandido at a panel, but I had bought that book from him on Friday, which he also signed.) They talked about the different media forms that were used to fill in the gaps and feed the ravenous hordes of Doctor Who fans after the cancellation of the show. It was very writer-oriented, which I loved, as I could relate to a lot of it, in theory if not practice. Dealing with publishers, what it’s like to play in someone else’s sandbox, funny stories about their experiences… gods, I really hope someone filmed it, filmed all of these panels, really. I remember being completely immersed (I didn’t take notes this con so I could do that), but as a result, my poor memory is sabotaging me. However, after the panel, the man who sat next to me who introduced himself as Rich asked me if I was a writer. I said yes, was it that obvious? He said that I’d laughed in all the right places that only a writer could relate to. I admit, I was quite flattered. We chatted in the hallway for a while about writing, publishing, fantasy, character vs. plot writers, and fan fiction. Thank goodness I wasn’t asked, “What is your book about?” because I still have no way to answer that in an interesting but concise fashion. But I did talk a little more in-depth about my fan fiction and how I use that to help my writing. I think this was the first time that anyone outside my immediate circle of friends has shown an interest in my work an could talk intelligently about it. So, thank you very much, Mr. Rich! I headed back to Panel 1 in the hopes of slipping into “Daleks vs. Cybermen: A Conversation with Terry Molloy and Colin Spaull.” Mr. Molloy played Davros in Classic Who and Mr. Spaull has acted in both the Classic and New Who series. Unfortunately, the panel was packed, so I took a quick photo of the two actors through the door and wandered off to find something else to do. Normally when I’m at loose ends I go to the Artist Alley or Dealer’s Room, but it was too late in the evening for that. There weren’t any other panels I really wanted to see, I wasn’t interested in attending the dance at midnight, and while I did think about going to see one of the musical performances, I was also getting tired. I wandered back down the long hall to the TARDIS photo booth, curious to take a look at it while things were quiet. One of the team running the booth, Steve Long who made an awesome Brigadier, explained the photo booth to me, as I’d never seen one before and had no idea how it worked. He also told me about a project that he and several friends were working on, an old-fashioned radio drama called “The Hawk Chronicles.” Radio dramas used to be a staple of American entertainment, as televisions were rare. It’s an art form that isn’t seen much anymore, but it’s great to see people making them. After we’d chatted for a while, I decided to try out the booth. I felt a little bad for doing it so late at night when they seemed to be packing things up, but it was actually really quick. You sat in the booth, which could hold two people comfortably in front of the camera. There was a screen that showed you where you were in the photo in relation to the different backgrounds you could choose. Each visit to the booth got you four photos with four different backgrounds in the set. I chose the set of TARDIS interiors, although I wasn’t prepared for how quickly the camera would take the pictures, which is why I’m glancing down in the second picture before I realized what was happening. For $5, I got two copies of the photos, and they’d be put up on Facebook as well. It was a neat experience, and I’ll probably do it again if I see them at another con or ReGen Who next year. Photos in hand, I decided it was time to head back to the hotel. I wanted to get some packing done before bed and get some decent shut-eye for the morning. The last quarter of my quesadilla made a nice dinner, and I was in bed and asleep around midnight. Like Saturday, there wasn’t anywhere I really needed to be until 10am, so the morning was once again unhurried. Yogurt and pudding again for breakfast and then the packing began in earnest. It actually didn’t take long to get everything squared away. I got into costume for the last time, took a few pictures of the room that had been my home away from home for three days, then carried my gear to the car and checked out. Thankfully it was neither as cold as it was Saturday nor as windy as it was Friday. I got to the con a little earlier than expected so I had some time to kill before the panel I wanted to attend, “The Master,” started. Once again, the Artist Alley and Dealer’s Room were closed (they opened at 10am), so I wandered back down towards the TARDIS photo booth. The halls were surprisingly empty; it was a little unnerving. A lot of them must have been sleeping or at the special morning event “Tea with the Doctor” in the Large Panel Room. (That was for VIPs only, and I don’t have that kind of money.) Down by the photo booth, I saw that they had a pair of Daleks. I’d seen them around the con before, but it was nice to get a closer look at them. I also wanted to get a picture of myself with at least one of them, but was too shy to ask one of the people nearby to take it for me. Instead I hovered, listening to their conversation and was eventually drawn in. It was one of those fortuitous and spontaneous things that happens at cons, so I got to have a long, fascinating conversation with Devlin and Stefani Sawyer, who had built and operated the white and gold Special Weapons Dalek Balor. Devlin started the 13th Cyber Legion for Cybermen cosplayers in North America, and Stefani was the first modern Sontaran cosplayer. The amount of time, effort, and detail that they put into their costumes is amazing. And it was really wonderful to hear that Sylvester McCoy, Sophie Aldred, and Terry Molloy got to see and take pictures with their Dalek. (They even signed it!) And Stefani was kind enough to take my picture with Balor when I finally worked up the courage to ask. I would have liked to stay and chat, but I could feel the clock ticking and wanted to get the rest of my purchases done so I could get back to the panels I wanted to see. I scanned through several vendors and found two with the buttons I needed. (A con tradition for me is to always buy at least one button. So I got a blue and black seal of Rassilon button and three others as gifts for friends. There was one more gift I needed, but I wasn’t sure what it should be. The last vendor I went to was an artist, Barry Sachs Illustration, who had some very gorgeous artwork. We talked for a while, and although it was interesting to hear about the art process, I was starting to feel a little faint from the heat and lack of water, so I feel like I wasn’t as attentive or gracious as I could have been. But I did pick out a coaster as the last gift and headed out into the cooler halls. It was after 11am, but not by much, and I headed back to the Large Panel Room to see “Terry Molloy: Davros – Demon, Dreamer, or Divine!” I figured I would only miss the first bit, but luck was with me; they were running a bit late, so I didn’t miss anything! And best of all, I got to take my same seat from the previous day, four or five rows from the front right beside the main aisle. (Which was great, especially since I was there for a little over four hours.) Mr. Molloy, in a Scottish kilt, was interviewed for this panel, along with a Q&A from the fans. He’s done a lot of work, both on stage and in theater, which I hadn’t been aware of. Apparently he also wasn’t the only actor to play Davros; with the make-up it’s hard to tell. Apparently, getting into the make-up took two hours and later he was bolted into Davros’s chair. 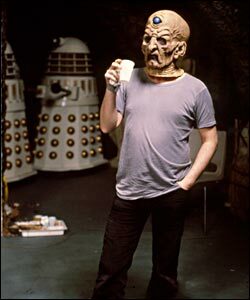 There’s an iconic picture of Davros drinking what looks like coffee on break. Mr. Molloy said that, no, it wasn’t coffee. It was actually dye to blacken his teeth and it tasted horrible. The next four panels were interviews and Q&As with the stars. First up was Mr. Sylvester. After the initial interview, he actually came down off the stage and wandered along the aisles, handing people the microphone when they raised their hands with a question. I was so happy that I’d gotten an aisle seat! He passed by me several times, sometimes just inches away. That was so, so cool, especially since I almost never try to get autographs or see stars up close. He’s very animated and can project very well, even without a microphone. And, as he said during the Q&A, he’s done pretty much every kind of acting and performance… except ballet. The stories he told were also hilarious, in both presentation and content, often delivered with a deadpan demeanor that makes it even funnier. (He even made a joke about being “the real McCoy.”) Apparently during his tenure as the 7th Doctor, they expected him to juggle… even though he had no idea how to. So he learned just enough to fudge it for the camera. At one point they were filming in… Europe, I think. It was along a cliff, and Mr. McCoy had to be suspended in a harness for, well, much longer than he would have liked. They got some nice long shots of him, but he said that if they’d been closer, they would have heard him howling curses. He also had to film in the Arctic one time (for a non-Doctor Who project). So the cameras could get unbroken snow in the shots, they’d take the actors around on a large loop, then leave them there for an hour or more while they got back into position and discussed the shot. Getting your lines right was difficult because your lips would freeze. For Doctor Who, at one point they filmed “in the great desert of Dorset” in the sand pits. Of course, Mr. Sylvester was stuck in his costume, which was not suited for the temperature, and the extras were done up in faux fur, latex, and make-up. Ugh. For another episode, they filmed at Waterloo Station on a holiday (I forget which one, it was an anniversary of something) and people were worried about the IRA setting off bombs or making some kind of dangerous ruckus. So of course, they filmed a huge battle between Daleks. The special effects people went a little nuts with the smoke and explosions. Windows shattered, car alarms went off, and folks all around thought that the IRA had blown up Waterloo Station. Mr. Sylvester said he was standing at the end of an alley when he saw an ambulance come barreling down towards him. Then the driver screeched to a halt, jaw dropping in shock as three Daleks came out of the smoke and crossed the street. (He also had a little more saw in his Doctor costume than the 6th Doctor. He picked out the hat, shoes, and umbrella. The knit sweater vest he was not fond of, as it was so very hot.) I really enjoyed Mr. McCoy’s stories and energy. He also played the spoons again, although this time it was on some of the audience members. It was just really neat; I could have listened all day. But, we only had an hour. Then it was Sophie Aldred’s turn. Like Mr. Sylvester, she also went out among the audience after the initial interview portion. (At one point, she also absconded with a cosplayer’s baseball bat, a signature part of her character Ace’s costume.) Ms. Sophie also was very cheerful with a lot of energy and clearly enjoyed her work, both on and off Doctor Who. (Here’s an example of just how awesome she is from a panel that I missed.) She said that the main reason she thinks she got hired to play Ace was because she had her own leathers and could ride a motorcycle, despite the fact that she never got to ride one in the show. However, she said that they did make Mr. Sylvester ride one and they nearly killed him. They put him on a motorcycle without his glasses and didn’t tell him how to drive the thing. He ended up throwing himself off the bike because they never told him how to stop. Another time, they had to get a shot while Mr. Sylvester was driving a van. There was a lot of expensive camera equipment strapped to the side of the van, and, once again, Mr. Sylvester had to drive without his glasses. (We need more characters who wear glasses! Stop blinding us!) Ms. Sophie said that, not only did they have to act, but she also had to make sure Mr. Sylvester didn’t sideswipe any lampposts. Another story she told was about an iconic scene where she beats up a Dalek with a baseball bat and evades a bunch of explosions. (And yes, Ms. Sophie did most of her own stunts.) At the end of the scene, the crew called for a break and she was told to sit down and breathe because she’d just been through the adrenaline equivalent of a car crash. Then everyone else left to get tea. So Ms. Sophie was sitting there, breathing and calming down when she heard a faint knocking and a voice say, “Could someone please let me out of here?” She hadn’t known there was an actor inside the Dalek that she beat up. So not only had the poor man inside been smashed about, he also got forgotten, trapped inside the Dalek! After that came the Q&A with Mr. Colin, the 6th Doctor. They had a microphone set up for people to go ask questions at, as it would have been a little difficult for him to go out among the crowd the way Mr. Sylvester and Ms. Sophie had. He talked more about the Big Finish audio dramas and how enjoyable it was to explore more of the 6th Doctor. He said that the most interesting characters, for him, were the ones that at first glance were unlikeable, but as you got to know them, the layers peeled away and you got to see deeper inside them as they grew and matured. He also shared some good stories, like the time they were shooting on location in Europe and their makeup got lost in transit, so they had to lounge around by the pool at the hotel for a day or two until it arrived. He said, “It was horrible.” A few people asked about the new Doctor Who, what he liked and didn’t like about it. He didn’t care much for the kissing and romantic elements in New Who, saying he felt the Doctor should more of a familial figure, a father or uncle or grandfather or older brother rather than a romantic partner. He really likes Peter Capaldi as the 12th Doctor (“every sixth Doctor they get it right!”), but also looks forward to a day when we can (hopefully) have a female Doctor. Most of the room agreed with him. (Part of me would love to see a female Doctor, but I’m also unsure of how that would affect the dynamic of the show, as I do enjoy having male Doctors to crush on. Either way, it’ll be interesting!) He also loved working on the 50th Anniversary spoof “The Five(ish) Doctors,” which was Peter Davidson‘s (the 5th Doctor’s) idea. When someone asked if he would like to do another project like that, he said absolutely, but it would have to be as good as or better than “The Five(ish) Doctors.” Nothing is in the works at the moment, but it was a labor of love. Another funny story was that, years later, when Ms. Nicola was spending some time with her step-son, he suggested they watch a movie together. She agreed and he went to get his favorite one… and it was one with her in it. (He had no idea that Peri in Doctor Who was his step-mom! She didn’t tell him until much later.) One thing that Ms. Nicola said fans would ask her was why Peri stayed with the 6th Doctor when he was so abrasive. (He tried throttling her after his initial regeneration.) And she said that it always made sense to her because the Doctor had saved her life. He’d become a surrogate father figure as well as a good friend. And even though he regenerated with a completely new personality, Peri could still see the same Doctor, the same person underneath. And she wasn’t about to abandon that person. “You don’t abandon a friend just because they are having a hard time,” Ms. Nicola said. All too soon, the panel ended and Ms. Nicola said goodbye. The very last event of the con was about to start, the final panel: “So, How’d We Do?” Oni, Harknell, and Kara sat down at a table onstage and, after introducing many of the staff who worked behind the scenes, they asked us for feedback about (Re)Generation Who. This was the first year for it and they wanted to know what they could do to make it better for next year. (Yes, they earned enough money to hold it next year! Hooray!) I wasn’t planning to stay for the entire panel, but I stuck around long enough to go up to the mike and say thank you for everything that they’d done. It was a fantastic con with an amazing guest list, especially for its first year, and I was looking forward to coming back. I had a great time at (Re)Generation Who! I’ll be going back next year and I hope that all Whovians in the area hear about this con and go to it in 2016. I think you’ll have a fantastic, brilliant time!